Why does the same class teacher stay with the class for several years? At Waldorf schools, a teacher is chosen for a first grade class and journeys with them until eighth grade. This continuity allows for a long-term relationship to develop as the teacher gets to know the students' strengths and growing edges. Students feel a sense of security and class time is maximized each year. Are Waldorf teachers specially trained? All teachers at WSCC are Waldorf-trained and most have a teaching certification from a recognized Waldorf teacher training center. Their commitment to children, education, and moral/ethical standards is at the highest level. In 1922, Dr. Rudolf Steiner spoke at Oxford about the "three golden rules" which a teacher must embrace fully, and which should shape his/her fundamental attitude: "to receive the child in gratitude from the world s/he comes from; to educate the child with love; and to lead the child into the true freedom which belongs to man." What is the school's policy on electronic media? WSCC is dedicated to nurturing children’s capacities for creative imagination, healthy emotional development, independent critical thinking, and constructive work in the world. It is generally recognized in mainstream society that many activities and tools that are useful and appropriate for adults can be unhealthy for the growing child. Research on child development increasingly demonstrates that spending time in front of a video screen and with other electronic media falls into this category. sleep may be disturbed, affecting overall health and immune function. 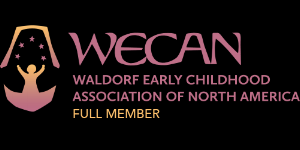 The foundations of Waldorf education rely on the richness of the child’s direct sensory motor and social experience in the three-dimensional world. In all the grades, handwriting and composition are emphasized in the curriculum. Premature use of a keyboard consists of a mechanical, multiple-choice (as opposed to creative) activity that undermines the skills and abilities being developed and nurtured in the classroom. The abstract, rapid, and cursory nature of email/texting also works against the fostering of grammar and composition skills. Chat rooms, Facebook, instant messaging, and texting simulate true human connection, remove the child from direct experience, and build a false social context, weakening efforts to promote real, meaningful social relationships necessary for success in adult life. What is a Main Lesson? The Main Lesson takes place in the first two hours of the grade school day, when children are at their most alert and focused. Academic subjects, such as history, literature, mathematics, and science are taught in blocks of four to five weeks. Main Lessons include review and discussion of previously covered material, presentation of new material, and time for the students to develop their own work on a related project. The Main Lesson may also be approached through the arts: drama, music, drawing and sculpture. It is an integrated and multi-faceted approach that supports intense engagement and fosters deep understanding. How is class work assessed? Number and letter grades are not given until middle school. Twice a year, the teachers write a narrative report, giving a picture of the child’s academic, artistic, and personal development as well as a description of the material covered in each subject. Reports are written for the parents and not to be shared directly with students. All special subject teachers also contribute to the reports. Conferences are scheduled twice a year to provide parents and teachers an opportunity to share their impressions and concerns. Additional conferences may be scheduled when parents have a concern about their child. Would a child be at a disadvantage if he were transferred from or into a public school? Students who transfer to a Waldorf school in the first four grades usually are up to grade in reading, math, and basic academic skills. However, they usually have much to learn in bodily coordination skills, posture, artistic and social activities, cursive handwriting, and listening skills. Listening well is particularly important since most of the curricular content is presented orally in the classroom by the teacher. The human relationship between the child and the teacher is the basis for healthy learning, for the acquiring of understanding and knowledge rather than just information. Students who are used to learning from computers and other electronic media will learn to adjust. Students who enter a Waldorf school in the middle grades often have to unlearn some social habits, such as the tendency to experience learning as a competitive activity. They will learn to approach the arts as a discipline and not as a hobby for personal expression. They will learn to relate what they are learning to their own life. At their stage of development, the subjective element is essential for healthy learning. Involvement in what is learned about the world makes the world truly meaningful to them. Children who transfer out of a Waldorf school into a public school during grades one and two may have to upgrade their reading ability and to approach science lessons differently. Science in a Waldorf elementary school emphasizes the observation of natural phenomena rather than the formulation of abstract concepts and laws. Waldorf students are well prepared in social studies, practical and artistic activities, and mathematics. Children moving during the middle grades should transition with ease. Often, transferring students of this age group find themselves ahead of their classmates. The departing Waldorf student is likely to take along into the new school a distinguishing individual strength, personal confidence, and love of learning.